This easy cheeseball recipe is perfect for entertaining. No fussy ingredients and ready in just a few minutes! Chop green onions and beef finely. Place your cream cheese, onion, beef, and shredded cheese into a large mixing bowl. Mix with your hands until all ingredients are thoroughly combined. Roll mixture into balls approximately two tablespoons at a time. Pour Bacon Bits onto a plate. 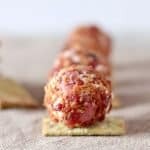 Roll cheeseballs in Bacon Bits, pressing firmly to coat. Refrigerate until serving and serve with crackers of your choice.